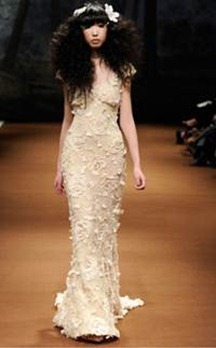 New York City’s Bridal Week (October 13 – 15, 2012) showcased amazing designers. 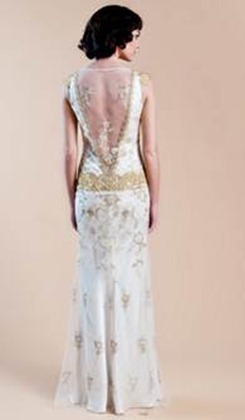 We would like to talk about Claire Pettibone’s latest collection. 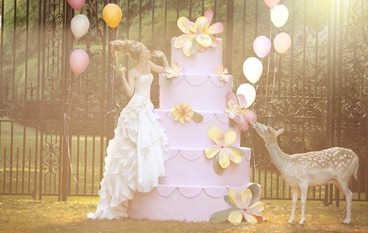 Exquisite, feminine and delicate designs that are expressions of beauty for your wedding day. Inspired in a languid summer in the French countryside …antique gold, toile and tapestries inspire the textures and details for the collection. The juxtaposition of gilded refinement and relaxed country living brings Parisian luxury to a rambling garden party in full bloom. An homage to the decadence of 18th century France, contrasted with the soft breezes of a warm summer night…kick off your heels, have a glass of wine, and live! 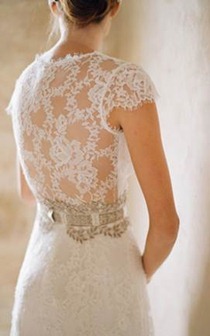 Silk white cap sleeved V-neck lace gown with silver guipure belt over full lace skirt lined in pearl silk. 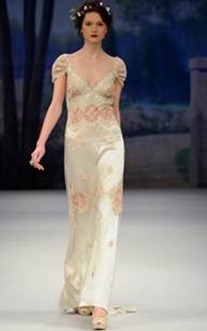 Capped sleeve sweetheart neckline gold embroidery inlaid with rose silk velvet. Gold embroidery on fine ivory tulle over a sumptuous pearl silk charmeuse wedding dress accented with gold guipure embellished drop waist, shoulders and neckline. Floral embroidered sweetheart neckline wedding dress over luxurious platinum silk charmeuse with vintage lace shawl and overskirt in powder blue accented with guipure embroidered waist detail. Swarovski floral filigree pendants strung from pearl & crystal chain on alligator clips with drop crystal detail. 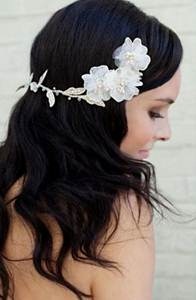 Floral vine with Swarovski sprinkled leaves. Ivory flower with Swarovski crystal center detail on alligator clip or comb.